My mom is fifty years young today! To celebrate the wisdom she’s garnered and shared in her lifetime, I present this list of invaluable life lessons. And for the record, I could have included so many more than fifty things… but then it wouldn’t be theme-y. So here we go! 1) It’s better to be ten minutes early than ten minutes late. 2) Leftover pizza tastes better if you heat it up in the toaster oven. Or broil it for a few minutes in the actual oven. 3) Life is all about balance. My mom enjoys a salad as much as she likes fries… and chocolate. 4) It’s never too late (or early… she’s up at 5am every weekday to take a walk!) to start a new habit. 5) One person doesn’t define you. 6) One struggle doesn’t define you. 7) Heck, none of your struggles define you. You’re stronger than you seem, braver than you believe, and smarter than you think. 8) She taught me the genius of “concentrated cleanup.” Setting a timer for fifteen minutes and cleaning in intense bursts a few times a week is so much easier than cleaning for a few hours once a month. 9) …And if you’re really pressed for time, vacuuming should be your first priority. The tracks on the floor are such a visible indicator of cleanliness that they’ll instantly calm your soul. 10) Wear sunscreen on your face every day, even if it’s cloudy. 11) Always bring a sweater. Even if you don’t think you’ll need one. Especially if you don’t think you’ll need one. And especially in movie theatres. 12) Perseverance is the key to accomplishing anything. Persevere always, in spite of the odds, even when people are doubting you loudly, and everywhere you look. 13) My mom taught me how to bob and weave at Disneyland (a prized skill among crowds of strollers and dilly dalliers). You gotta go in with a strategy if you want to Disney hard. 14) Tea, especially when it’s of the Teavana Cocoa Caramel Sea Salt or White Chocolate Peppermint varieties, is delicious. 15) Kindness never goes out of style. 16) Kindness towards yourself is essential. 17) A bath, a cup of tea, and some quality alone time make the best recipe for a little self-care. 18) Happiness is something you create for yourself; you don’t look for it in other people or external circumstances. 20) …But He doesn’t always answer them in the ways we expect. He opens a lot of windows when He closes doors we always thought we’d walk through. 22) It’s vital to make time for the people you love, in ways large and small. She talks to my sister, my aunt, my grandfather, and me nearly every day, and sends us texts to let us know she’s thinking of us on days when her schedule is too crazy to slip in a phone call. And she does this even if she’s already talked to a hundred people that day (which she usually has… she’s a school principal). 23) Speaking of the fact that she’s a principal… she accomplished that career shift within ten years of becoming a teacher. And she went back to school to become a teacher when my parents divorced, after being a military wife for fifteen years. She taught me that you can decide, at any moment, to change your life. 24) Sometimes a good cry is the best and only solution to life’s problems. 25) And everything always looks better in the morning. 26) Money is always better spent on experiences instead of things. And the best kinds of experiences are the ones that involve the people you love. Trips and vacations, though costly, allow for the priceless memories that we’ll cling to forever after. Surprises are excellent for that, too. 27) My mom taught me how to clean out my closet, and honestly every other part of my room. Before there was Marie Kondo’s Life-changing Magic of Tidying Up, there was my mom shouting, “Be ruthless!” when I took a half-second longer than necessary to determine if I wanted to keep something. 28) Life is about making time to enjoy the little things. 29) Fairy lights should be strung up whenever possible. 30) The yogurt in the fridge that’s three days past its sell-by date is still okay to eat. 31) The pizza hanging out there a week after it was ordered definitely isn’t. 32) Sometimes you’ve just got to sing. Loudly. To Broadway showtunes (especially if they’re Les Misérables’ “One Day More” or A Chorus Line’s “I Hope I Get It”). Rolling down the car window not optional. 33) It’s important to learn to stand up for yourself. 34) Sometimes the best thing you can do to comfort another person is just listen. Sometimes she doesn’t have all the answers when I come to her in tears. Sometimes she just says, “I know that’s really hard.” She is the living presence of God in these moments, sitting with me, listening, and it is enough. 35) She taught me how to lead the psalm at Mass and cantor like a boss (is that something you say about leading music at church? It is now). 36) Make time to invest in your creativity. My mom has prioritized pursuits like her involvement in community theatre, and the binding of precious family memories in scrapbooks we’ll cherish for years to come. 37) Make time to invest in your friendships. Making (and keeping) grown-up friends is such a challenge. They’re a lot of work. And often you might feel like you’re giving more than you’re getting. Keep giving anyway, and keep being there for others. 38) Great food doesn’t have to involve cooking. There’s a whole category of scrumptious meals that can be created by “assembling” (i.e. not turning the oven on): salads, fruit and yogurt desserts, sandwiches, etc. 41) Always ask how you can help. 42) Always offer words of encouragement. 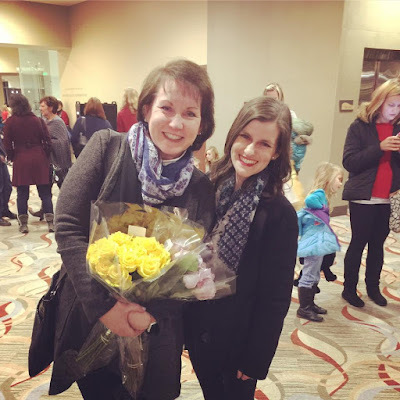 43) She taught me to appreciate Broadway (I thank the brainwashing that started with us listening to the Joseph and the Amazing Technicolor Dreamcoat soundtrack on repeat when Lizzy and I were tots). 44) It’s okay not to know things. And to stand in the grocery store legitimately wondering if you can use pasta sauce as pizza sauce (and that, spoiler alert, you totally can). 45) Carry a little notebook to write down spontaneous lists. This is a much better technique than trying to remember everything later, and crossing items off on paper is so much more satisfying than erasing them from your phone. 46) Beauty is about working with the gifts you’ve got, not striving for something you don’t have (see: learning to embrace my straight hair. Bless my mom for using entire bottles of hairspray to keep curls in place when I wanted them). 47) Don’t use Clorox wipes to clean mirrors. Or windows. 48) You’re never too old for shoes that sparkle. 49) Keep an extra pair of sunglasses in the car. Also, a bottle of lotion.